Rated PG. Parental Guidance. General viewing, but some scenes may not be suitable for young children. This is an Eros Internationl brand of the Hindi DVD. Has the UPC Code 828970002899. Has EROS Seal. Widescreen. 175 minutes Color. Dolby Mono Sound. MOVIE HAS ENGLISH SUBTITLES-SONGS IN HINDI ONLY, NOT SUBTITLED. . Music: Kalyanji Anandji. 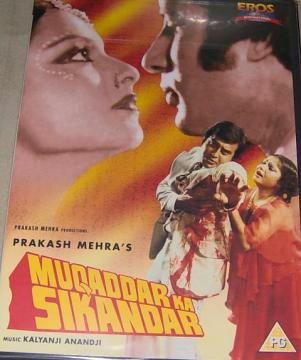 Staring: Amitabh Bachchan, Rekha, Vinod Khanna, Rakhee, Amjad Khan & Others. Release Date: 27 Oct 1978 (India). Orphaned and abused at a very young age, a young boy faces the harsh side of life as he struggles to make a living by slaving day and night. He gets empathy from Kaamna, a little girl, in whose house he works. Her dad abhors his presence in their house and asks him to leave. He is then adopted by a Muslim woman, who names him Sikander. Years later, Sikander now grown up has amassed a fortune by turning in smuggled goods to the police, and getting generous rewards. However, his heart still lingers for Kaamna. On the other hand, Kamna, doesn’t want to do anything with Sikandar and spurns him. He frequents Zohrabai, a prostitute. When a young lawyer, Vishal saves his life, he takes him home and treats him like a brother. Vishal is unaware of Sikander’s feeling for Kamna and falls in love with her. Sikandar feels betrayed by his best friend. He turns to Zohrabai for solace, only to find her dead. Sikander must now decide to end Vishal’s life or kill himself in order to forget Kaamna. Buy Muqaddar Ka Sikandar (DVD, 2005), sold & shipped by Movie Time Video where you can shop online for Pooja Mandir, Bajot, Gifts, Hindi Movie DVD / CD, Music Video. This Hindi Movies collection has been tagged as B6 1 RR 2.50 9.48 sam amitabh bachchan rekha vinod khanna rakhee amjad khan.